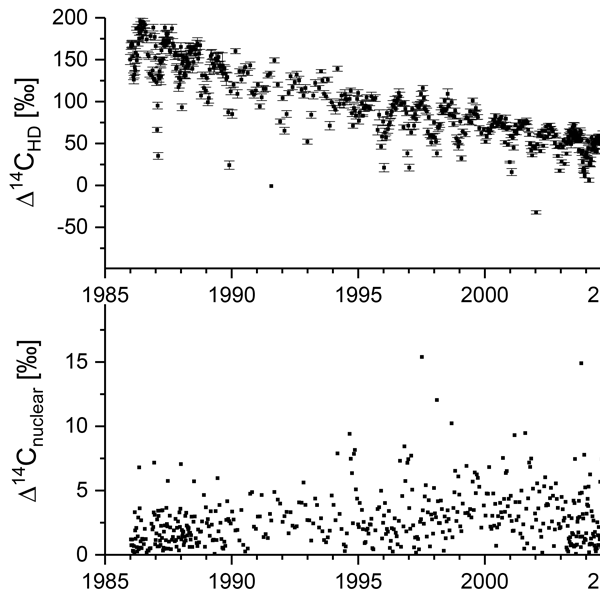 Atmospheric 14CO2 measurements allow for estimating the regional fossil fuel CO2 component. However, results potentially need to be corrected for 14CO2 contamination from near-by nuclear facilities (NF). Our dispersion estimates of corresponding contaminations for Heidelberg, based on differently resolved wind fields, show differences of up to a factor of 2. Estimates from highly resolved models coupled with temporally resolved 14CO2 emissions from NFs are required for more accurate results. Atmospheric processes are imprinted in the concentrations of stable water isotopes. Therefore, isotopes can be used to gain insight into these processes and improve our understanding of the water cycle. In this study, we present a new method that quantitatively shows which atmospheric processes influence isotope concentrations in near-surface water vapour over Europe. We found that the most important processes are evaporation from the ocean, evapotranspiration from land, and turbulent mixing. We present a dual tracer atmospheric inversion technique to separately estimate biospheric and fossil fuel CO2 fluxes from atmospheric measurements of CO2 and 14CO2. In addition to estimating monthly regional fossil fuel fluxes of CO2, this system can also reduce biases in biospheric fluxes that arise in a traditional CO2 inversion from prescribing a fixed but inaccurate fossil fuel flux.